Hi, here's our challenge this week! Pictures where you have found the subject, ask or not and get the image fast, just enough to choose your position, maybe even there's, but not more than 20 secs or so! I'll start. I visited an antique store and the Armenian gentleman was fascinating and friendly. I asked for his picture and turned him towards the light. The idea is to do the capture on impulse and process so what is in your heart shows the image. Now show me yours using any format camera, from digicam, to polaroid, or MF! That, my good friend Nicolas, is wonderful and I know that was 4 secs at the most! We were at the Huntington Library in Pasadena a few weeks ago. Great location for walking around. But to change away from the scenery, ISO 160 - 70-200 at 5.6 - 160 - 5D cropped out the stroller she was sitting in. The carnaval starts today (officially). In the afternoon, I have taken some pictures on the streets. All were taken in the nick of time, so I had a maximum of 2-3 seconds to compose and take the pictures. The last one was a bonus. This little guy walked past me, and he has pointed a mirror towards the camera. I ended up taking a self-portrait (LOL). Enjoy! The only thing I remember is ISO400... Well... No, I don't remember. ) 17-35 for sure though. After seeing this picture of Ania, I was wondering whether you've had your testement updated recently (LOL). Man, you are soooo dead ;-). Great shots and different styles. I'm impressed how some subjects can get into a pose so easily and how the photographer also can capture the communication of the person. At first I had that jealous feeling when one sees a face with porcelain skin and think, "What a wonderful find!". Then I realized the carnaival brought out masked revelors who really play their parts well. 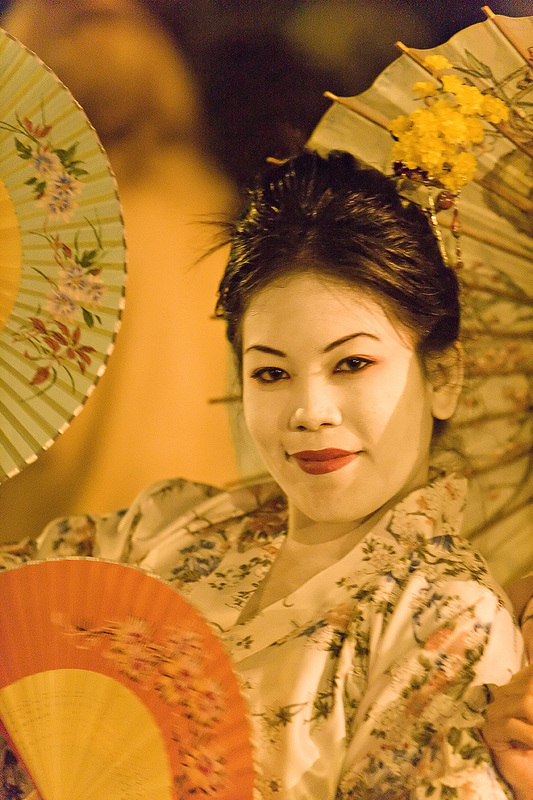 This posing in a street carnival reminds me of the wonderful picture by Nicolas Claris, above, of the Japanese Geisha with the 2 decorated paper fans and the umbrella all in perfect composition with the girls body and face. That girl, Kathy is open, happy, content and inquisitve yet timid. That girlfriend is another matter! She's for sure wanting to know if it's really another day! Yes, she's is inquiring too, "What planet are we on and do they serve coffe?" I like this very natural and revealing picture. Does it have the same meaning to you in B&W or is the color part of what's needed to make it work? Please take note, Wojtek finds the color made his picture! So that's one for you! Still, I wish you might yourself expriement with the hypothesis that some pictures bring out the character and essence when the color hues and transformed and shared out as nuanced tonality to complete the picture! One of the great things about portrait photography is you can shoot the same subject many times and get different emotion from each shot - even over and over in the same session. There are millions of people out there and all are different. We will never run out of subject matter. My young girl was with her sister in another stroller. Barely you would know they were even related. I could not shoot her - her expression and hair were wild and she had fear written all over her face way before I approached with my lens. Her mother asked me not to take any more after the first and I deleted it. As happy as my photo above was, her twin was not. Actually, she almost haunted me and broke my heart to see that emotion in so young a child. Wojtek, I think Ania does not know how to delete photos from your camera. My husband stopped taking my pictures, since I delete them. I do love the expression on her face - no mistaking what she was telling you when you clicked the shutter. This is little Lillie, one of my friends daughter. She is a fun loving child and my camera just loves her. Not a recent picture per-se, taken last July, but is a candid shot with not much time to set up, she polished the cookie and run off to play with the rest of the children. PS Cs2, Levels, curves and saturation, saved to web. This was before she became too fast to focus on - now I think I need an autofocus camera to capture her. Correct me if I am wrong guys, but from the beginning it looks to me like "oh gosh, how could you do it" type of thing, even, if some of you like it... Why? Here is one of my unposed grab the moment shots, I titled it "Help Me". The one year old looking to me for help, his mother asking his grandmother for help. Look at The Online Photographer, he refers to the gallery of Evren Sahin who uses interesting framing with the key subject in a separate compartment. In Evren Sahin's India gallery, notice how he often partitions the frames, dividing the visual space up into completely separate stages, and how skillfully he places central subjects at the edges of pictures—sometimes, as here, mirroring the edges. He has a great knack of shaping radically cropped elements. I can't remember the last time I've seen new work that uses the frame so energetically. 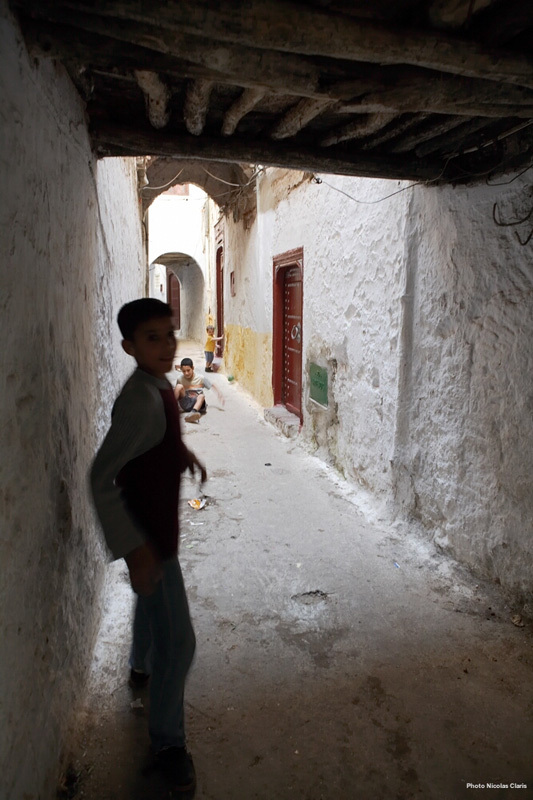 So your first Morrocan street picture might be in that class if you opened up the left side. Worth looking at for composition. Yes indeed two people trying to get help! The there are really 3 people demonstrated. The 3rd being you! 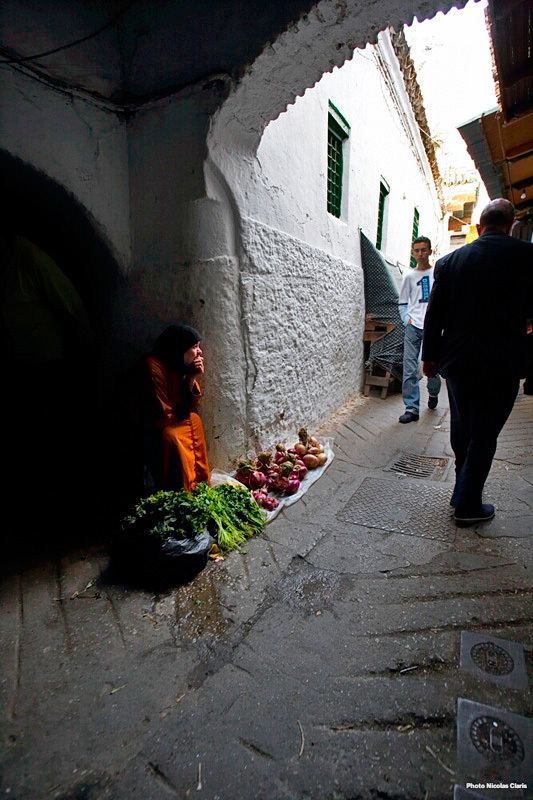 In the first Morrocan street picture, IMO, no need to open-up the left side (beleive me, I tried!) then the central character (the woman in yellow dress) tends to be more "centered" and the man behind her appears more clearly. I wanted her to attract the eye though sh'es not in the center of the frame. Thank you for looking at these and for your comments, it, at least, gives me the opportunity to describe my feeling and wishes when I shoot. I hate that verb! as if my camera were a weapon! has anyone any suggestion instead? Asher, I really like this portrait. I feel like I know this man for long! So much humanity in his eyes but so much too in yours! BTW, I noticed you used the 50mm at ƒ1.2 hence the DOF, but I'm not sure that the DOF is 100% natural, did you add a bit while PProd to the one that gets off of the camera? Thanks for you kind comments. I'm still experimenting with the narrow DOF. Sometimes less is more and I'm trying to determine when one should be narrow and how this alters the effect. No there's no blur added in photoshop but I did sharpen his lips, around his eyes and right cheek. I might bracket the aperture! Now wouldn't that be a great function or tell me is this already one of those PF I have not used? Re you first Morrocan picture, at least on my screen, I can't really make out enough on the left. Can we have just a tiny amount more light there! 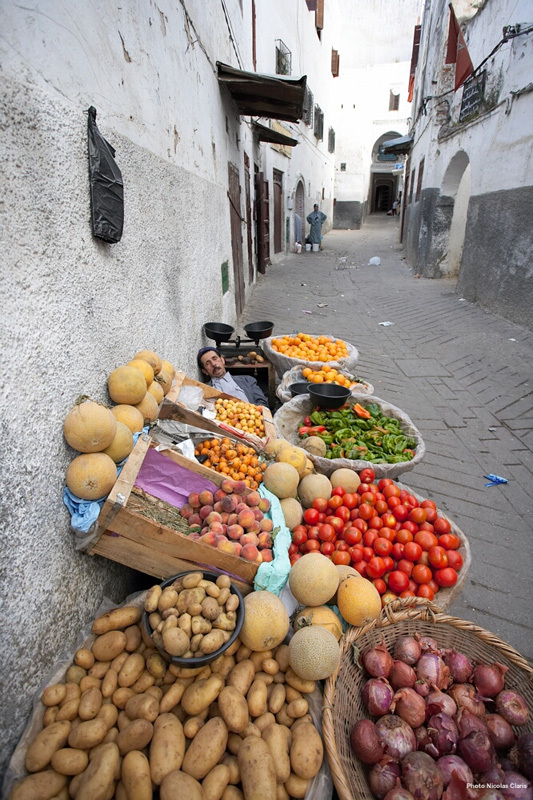 The picture with the fruit and the lady at the end of the street is amazing. A lot of action yet no movement! One can only imagine all the thoughts in this woman's head as hse stands almost as the guardian of the street or is she waiting for someone? Whenever one has to ask oneself questions like that, I believe the picture starts to transcend the collection of recorded objects to a representation of something about the human condition in general. That picture could be on my wall and I would never get gtired of it! Just a little extra inquiry. Was this with your Sigma ultrawide zoom and what focal length? Also have you considered correcting the distortion and if you looked at that variant, did it take away from the picture you now present? In a way, distortion bring the photographer's peresence in the picture or else it might turn one off. Now I see her better! If we could crop off the picture above the first metal manhole on the right it might be an idea (one manhole anchors the bottom of the scene very well) and then it would also allow me to say I took the picture myself! Now I've got to leave you as have just received a call for an invitation (BUT NOW, they said) for some oysters and white wine. Nope! sorry, I keep it as it is now! How did I know that! When you present a picture is is made and that's how it should be. Still, from a viewing perspective all the way here in Los Angeles, one manhole is enough. So not that I really want to change you picture, I'm just offering a ppoint of view that might be considered in general! And what about the other person lurking in the shadows? Nicolas already put a flashlight on her face. Now you are in trouble!